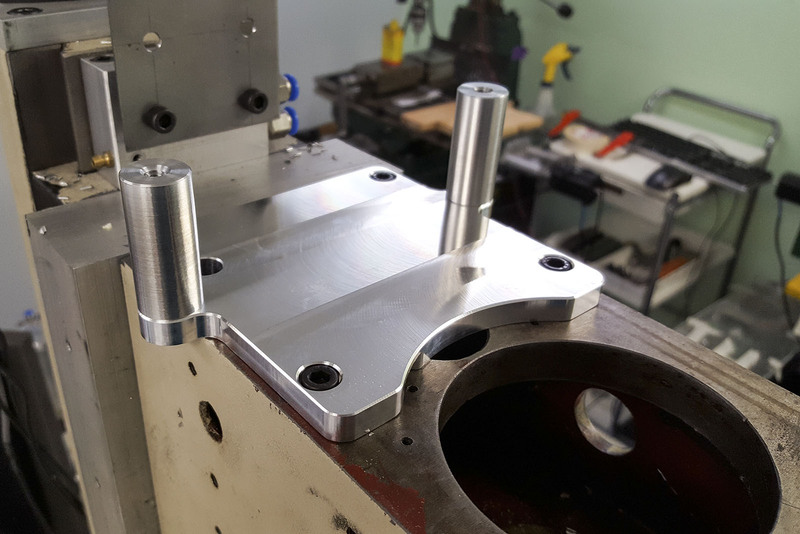 I would like to use machined aluminum components to finish my 3d printer, so I need to get my CNC mill operational again. The mill was functional in the past, but at the time I was very rushed and made some non-optimal choices. It is currently stripped down and requires some work. The first step of this process will be installing a Benchtop Precision Belt Drive Kit. Note that this kit can take nearly a year to ship, so I do not recommend purchasing one at the moment. Despite its long lead time, I was very pleased with the kit. The parts are beautiful and everything seems well designed. Assembly is quite straightforward. 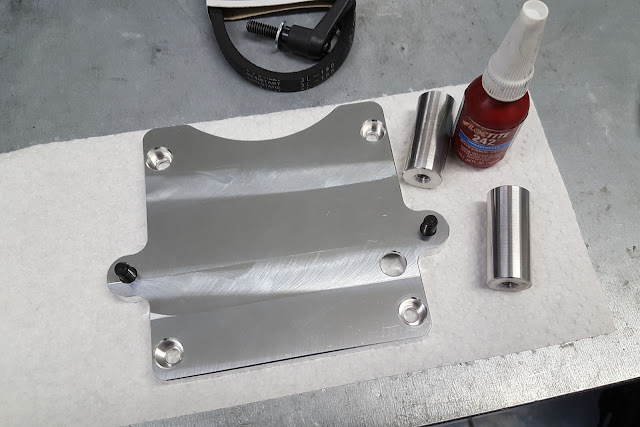 I used blue Locktite for the fasteners as the mill is likely to experience vibration. Note that if you intend on going higher than about 3,000RPM with this kit you should regrease the bearings before installing them. The synthetic grease they come with is far too viscous for high speed operation and will generate too much heat. 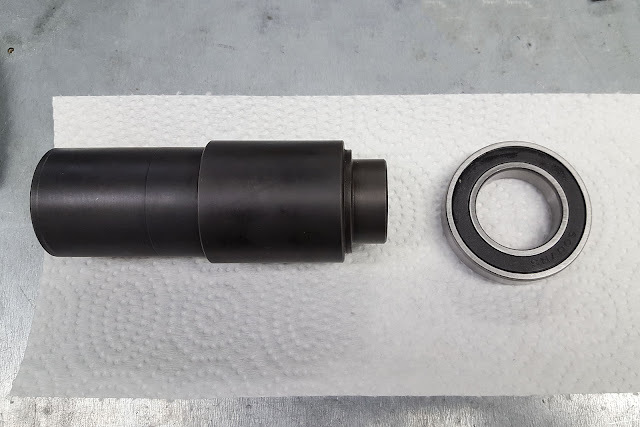 I did not regrease the bearings when installing the kit and was forced to remove and re-install the kit at a later date. The bearings were regreased by removing the seals, rinsing with acetone, and applying Kluber Isoflex 15. 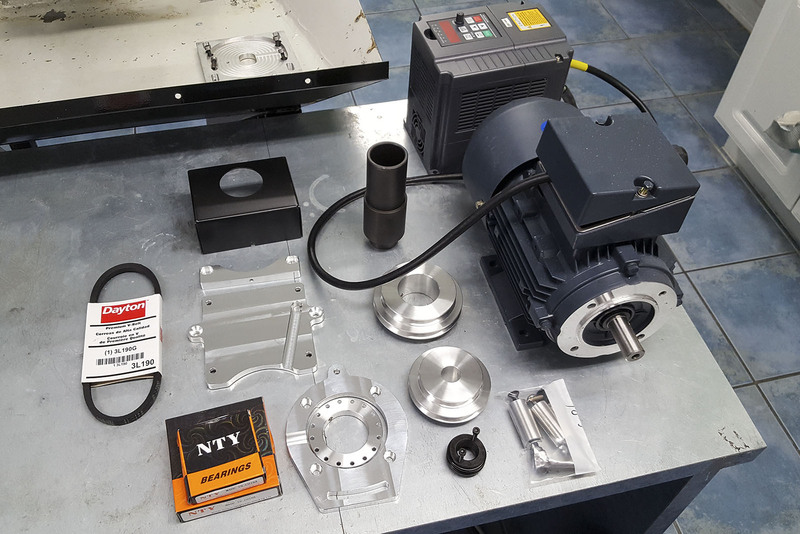 Press-fitting bearings onto the spindle carrier is the hardest part of installing the kit. This is an extremely frustrating task because it is an easy ten second job if you have correct tool. 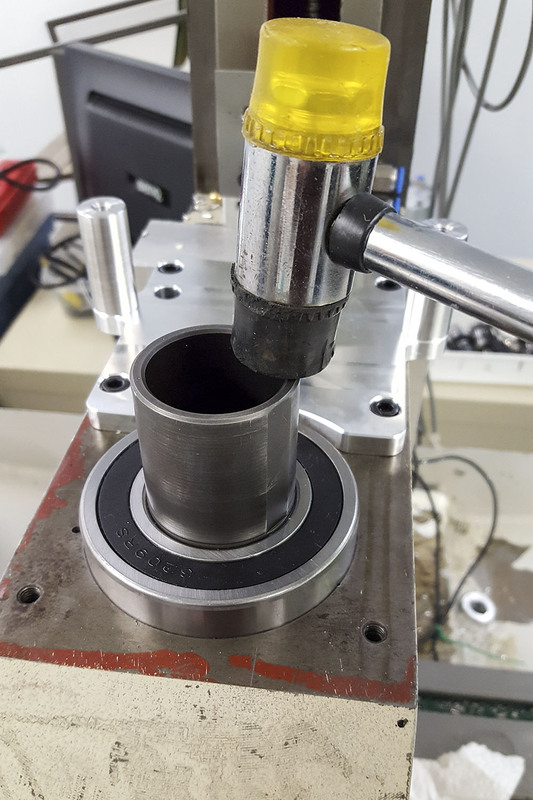 However without a hydraulic press, seating the bearings can take hours of frustration. I absolutely hate using a mallet to seat bearings due to the risk of damage, so I've come up with some other tricks. 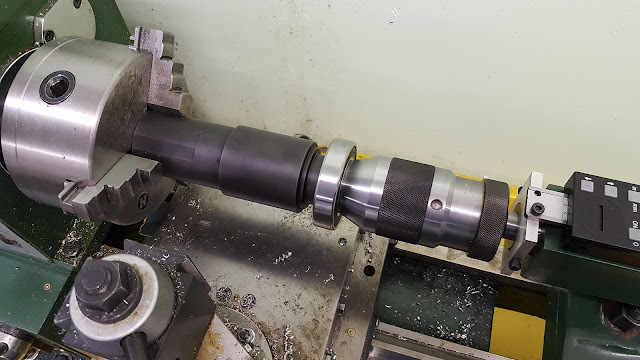 The following procedure is extremely questionable and should never be performed on a high quality lathe, but I include it for your amusement. 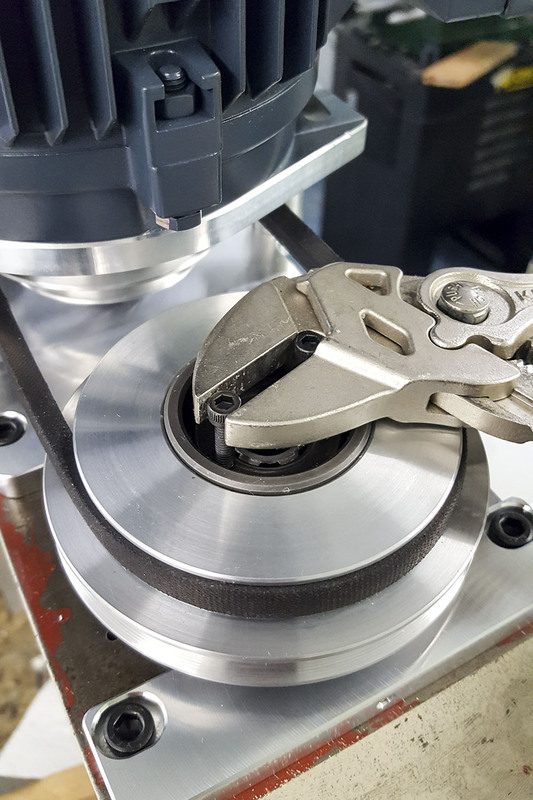 Gently clamp the bearing carrier in the lathe chuck and then apply force to the inner race of the bearing by feeding the tail-stock. 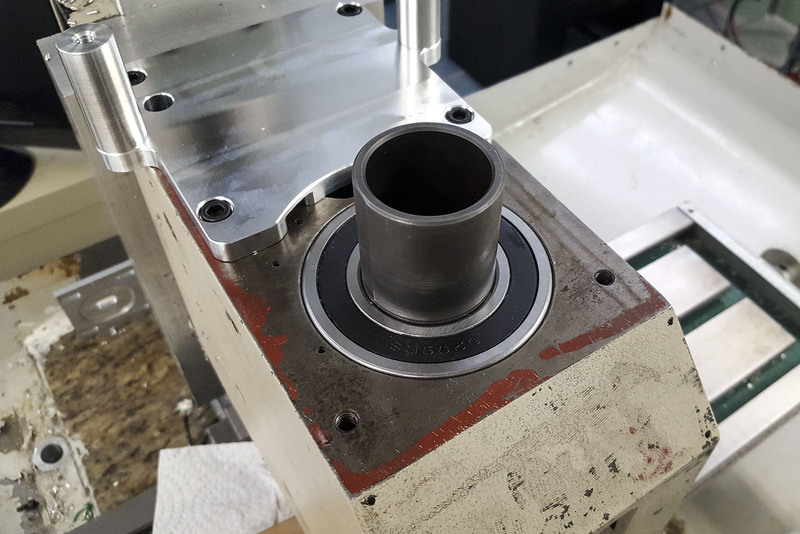 This ensures even pressure and good alignment, but applies a ton of force to your lathe bearings. 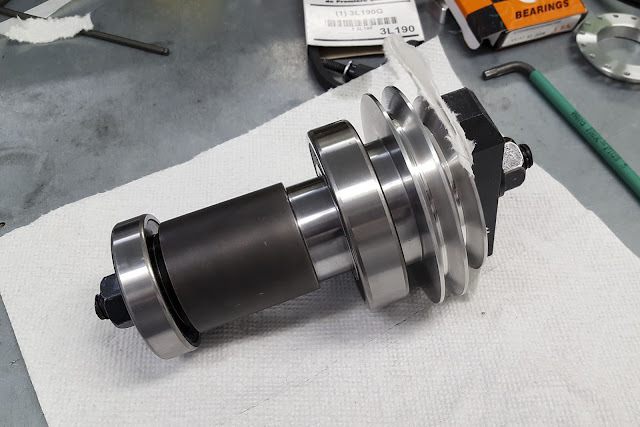 Be gentle or you will permanently damage the lathe. 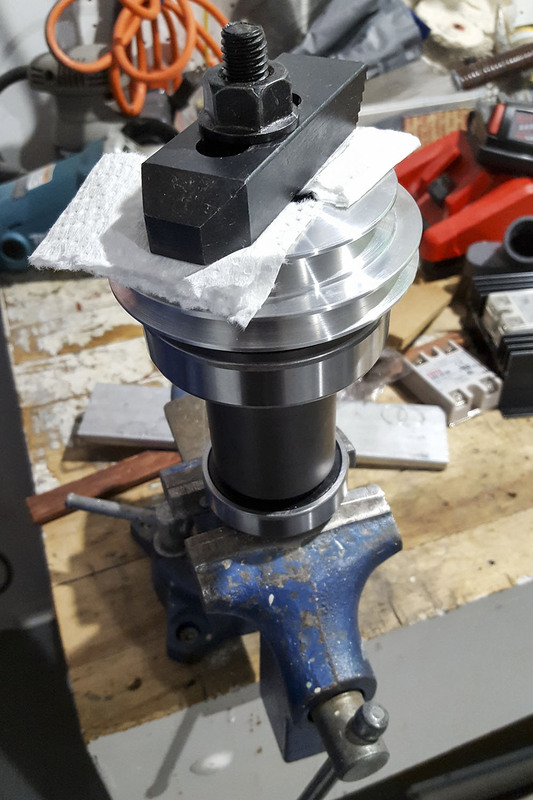 The second bearing is harder to seat so I used a machinist hold-down kit through the spindle carrier to force it on. The pulley was used as a spacer, and a layer of paper towel was included to avoid damaging the surface finishes. Holding one end in a vice makes it easier to tighten. 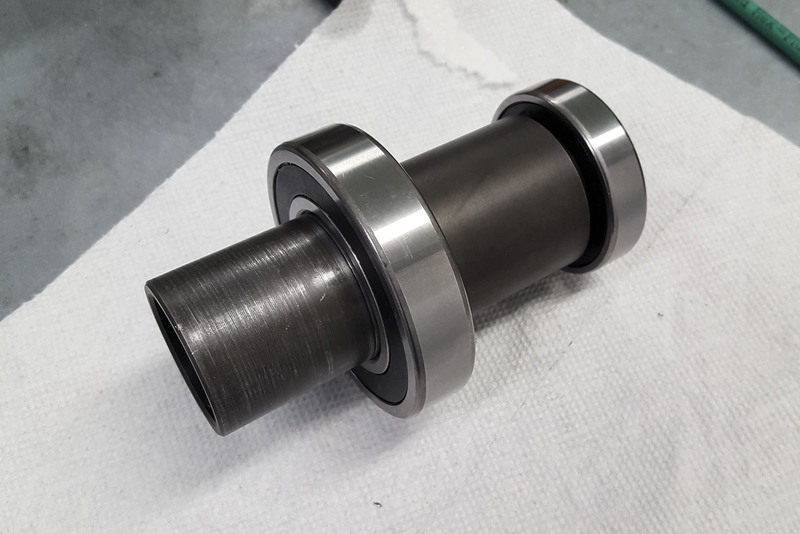 And thus the bearings are finally mounted without the use of a press or hammer. The casting has a much looser bearing fit so you shouldn't need any heroics to get it seated. Make sure the casting is clean and oiled, then push it in by hand as far as it will go. Finally you can bring out the mallet, but it will only take a handful of taps to seat the outer races into the casting. When properly installed the bearing will be flush with the top of the casting. 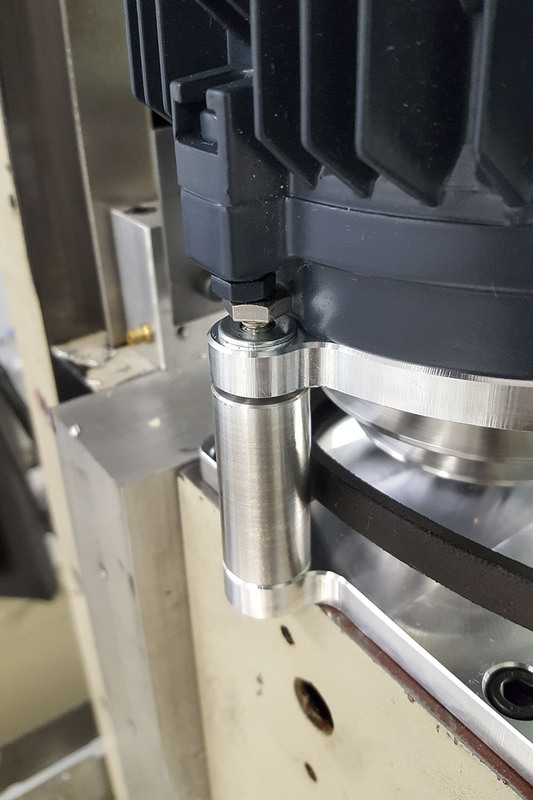 Mounting the pulley to the motor shaft is also somewhat frustrating without the use of a press, but since the center of the motor shaft is threaded you can pull it on with a screw. Tighten the screw until it bottoms out, then add a few washers and repeat. Eventually the pulley will be flush with the motor shaft. 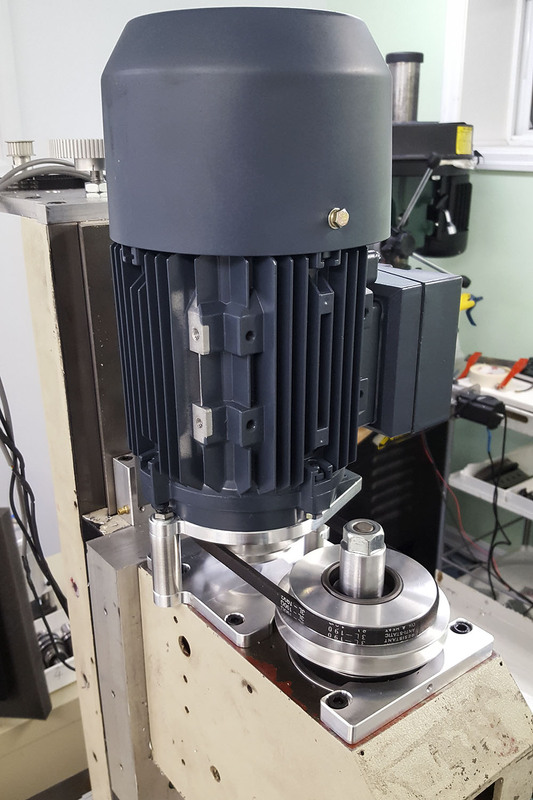 I am using an over sized motor with my kit, so there is some interference between the mounting plate and the motor. Luckily it can be worked around by replacing the socket cap screws with hex bolts. 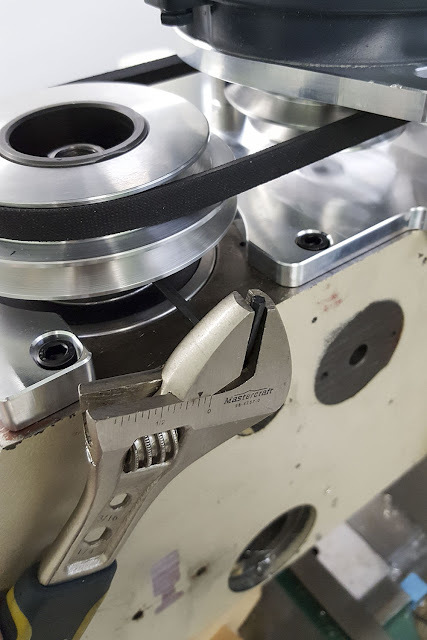 The second pulley slides over the carrier. Use Locktite and tighten well, as it must transfer a lot of power in use. 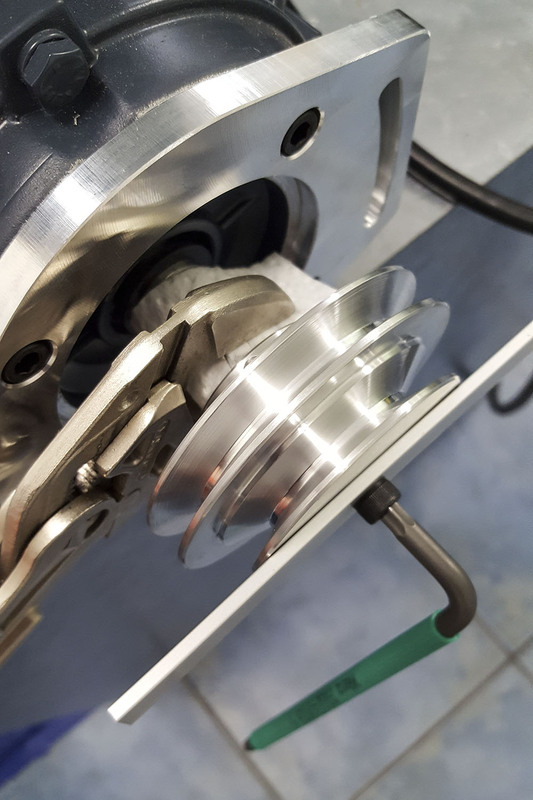 The last piece of the kit is an o-ring collar that suppresses vibration. It must be screwed into place quite deeply using temporary socket cap screws, which are then removed. 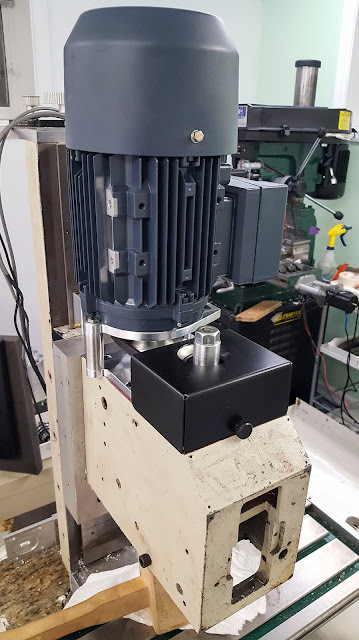 The motor is almost comically oversized for the mill, but unfortunately Leeson only sells a very small and a very large motor. Something in the middle would have been more appropriate. 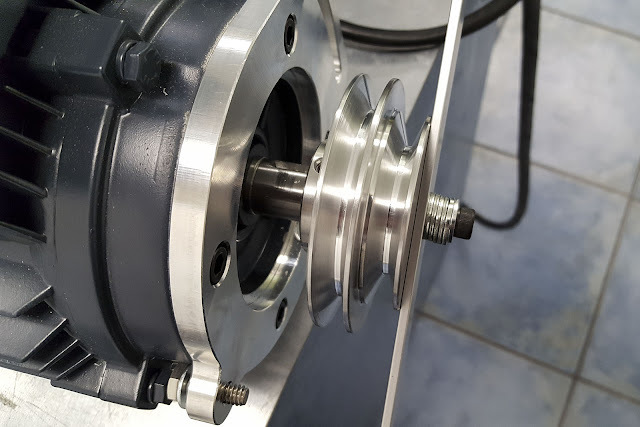 This completes the installation of the belt drive kit. 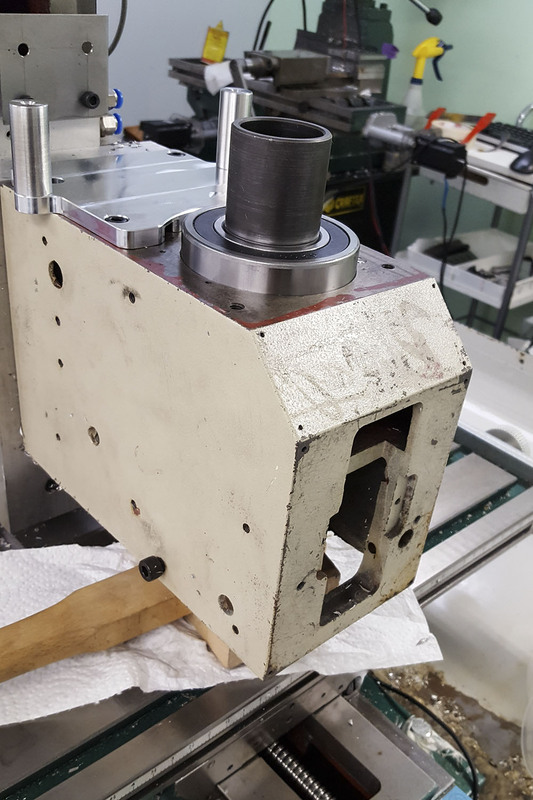 The bearings must be broken in by running them for several hours at gradually increasing speeds, but that will have to wait until the controller and electronics are installed. This post was quite focused so I'm not sure if it will make sense if you are unfamiliar with milling machines or machining in general. I'll continue to work on bringing the mill into a functional state over the next few posts, which should help clarify things.